MEAN (Middle East Architecture Network) is a design research collaborative. It is an interdisciplinary community of Architects, Designers, Programmers, and Artists. As an Innovative Architecture Practice, MEAN's mission statement is to amalgamate computation, material research, and design, providing Innovative solutions in response to current technological and economic trends, factors integral to the planning process. MEAN will aspire to derive beauty from performance, efficiency from scarcity, and the elevation of the human condition from political friction. MEAN*, Middle East Architecture Network designed and built the Audi Innovation Hub in Dubai Design District for Dubai Design Week 2018. Audi commissioned MEAN*, an innovative Dubai-based architecture practice, to design the Hub to reflect their brand ethos of “ Vorsprung durch Technik ” or Advancement through Technology and to reflect the theme of this year’s Audi Design Award; 'Connections'. Starting with a line - the simplest geometry used to connect two bodies - MEAN* envisaged a curved structure sweeping in space, bridging exterior and interior spaces, woven with connecting lines. 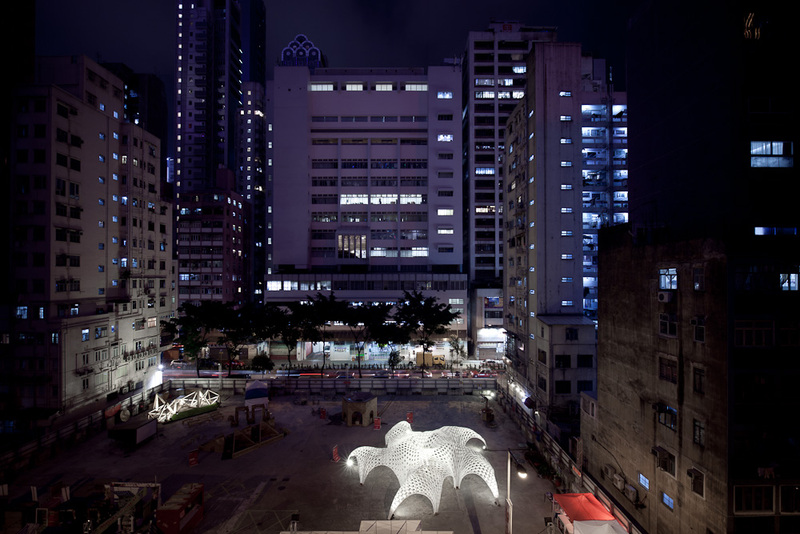 MEAN* worked with generative design tools and digital manufacturing as well as aluminum, galvanized steel, tensile cables and recycled rubber from car tires to build the structure as a spatial innovation apparatus that pushes the boundaries of structural and architectural design. The CNC-bent steel pipe structural elements provide a guided path for tensile cables to connect through, generating a volumetric space as well as adding to the synergetic structural hybrid. These straight lines rotate through weaving, overlapping and connecting to generate an animated effect of streamlined dynamism, expressed through the overlapping of the lines, commonly known as the 'Moire ́' Effect'. The intention is to provoke the animated experience of a road trip, as the visitor walks around the pavilion. The design features a symmetrical architectural and structural layout that recalls the balanced nature of the contemporary automobile. The mechanically fixed structure is identical on both halves of the central symmetry line, for ease of fabrication, assembly and reassembly. 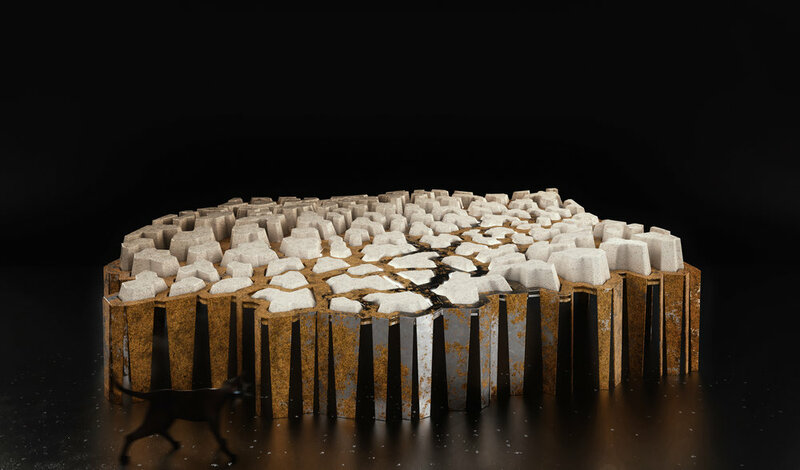 The central spine of the space features an arched covering, fitted with generative lighting patterns that resemble symmetrical constellations. The brightly lit, digitally manufactured structure, is a white contrast to the black matte rubber surface manufactured and supplied by Bee’ah, which covers the façade of the structure. The material, made from reconstituted vehicle tires, has been recycled into an environmentally conscious and efficient building material. Fitted with a space for the latest Audi A7 to be showcased, an area for talks as well as a space for refreshment and gathering. The space provided the venue for the week-long program of Audi Innovation Talks, showcase space for two of the latest Audi models and the winner of the annual Audi Innovation Award. As the ‘Middle East Architecture Network’, MEAN uses design as a tool to raise awareness on issues surrounding environmental, political and economic conditions in the context in which we are working in. MEAN believes that design can cause change and we are working actively to spread awareness through our work. As part of our workflow, we collaborate with humanitarian and social networks, and help them spread their message through design installations and other pro-bono projects. MEAN is committed to architectural design that is contextual to the location of the project. We work with cutting-edge technology to envision innovative solutions to contemporary spatial design. 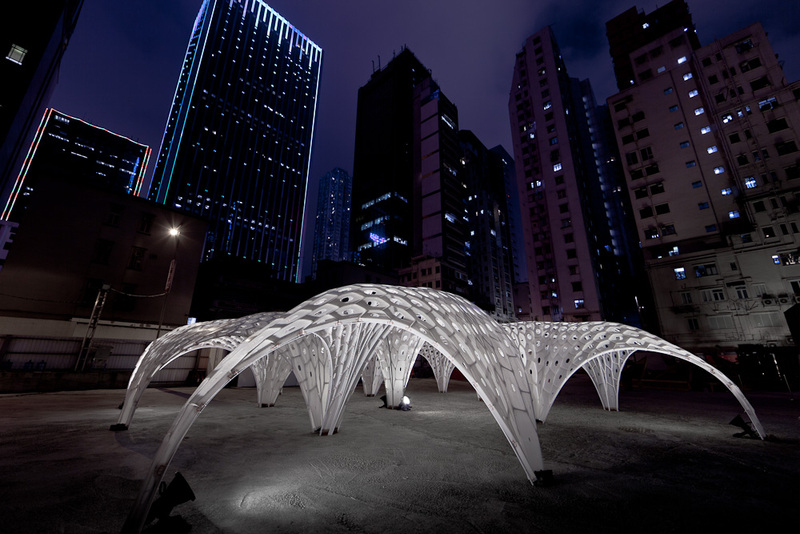 At the forefront of the architectural design process, MEAN utilizes generative design methods, computational simulation and digital fabrication using local materials and expertise. We work in feedback loops between digital simulations and analogue tangible materials. At MEAN, we are committed to design research. We believe in the myriad of possibilities made possible by the fourth industrial revolution. We are constantly experimenting with methods to design and build exciting, spatial and structural pavilions, paving the way to a seamless design to production construction process. We believe that the seamless integration of computational design, digital structural analysis and CNC manufacturing will become the future of construction. MEAN is a network of talented individuals spread all over the world. As part of our vision, we encourage interdisciplinary collaboration between different cultures and expertise, to achieve design excellence. Questions? Want to hire us? Drop us a line.